Do you want to build a snowman? Or just see what it feels like to create ice on a whim like Elsa? It’s easier than you think. 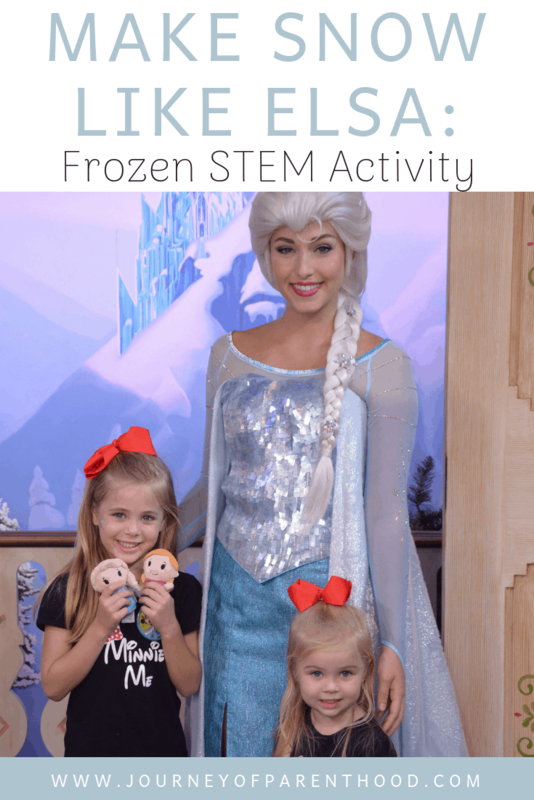 If your kids love the movie Frozen this is the perfect way to take advantage of that and get them excited about science. Who wouldn’t want to make their own snow and ice? Take advantage of your children’s love for this fun movie and toss in some learning. It’s pretty fun. 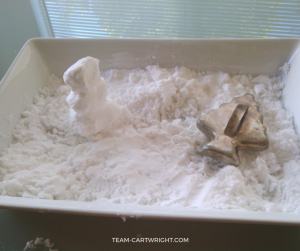 Here are two sensory STEM snow activities for Frozen loving kids. Adding some STEM to the play just makes it better! Yep, kids need science too. Don’t worry, it doesn’t have to be hard or scary. These activities need 3 things between both of them. You can do this. Just like Elsa made it snow, you can create your own snow to play with, regardless of the temperature outside. Measure out 3 cups of baking soda and place them in a bin your kids can play in. Add 1/2 a cup of conditioner and mix it together with your hands. Then hand it over to your children to play! What is happening here is a simple chemical reaction. The key thing that makes it different from a lot of other reactions is that it is endothermic. This means that heat is absorbed during the mixing process. As a result, the snow actually feels cold. This is a great one to let your little ones experiment with. What happens if you change the ratio of baking soda to conditioner? Can they make a lighter snow? A wetter one? What makes the snow stick the best? Else is able to freeze things just by touching them. 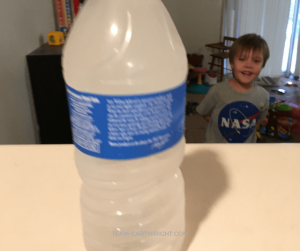 I can’t really promise your child can do that, but they can flash freeze some water just by hitting a water bottle. Put an unopened bottle of purified water on its side in the freezer. Try to make it so nothing else is touching the bottle. Leave it in there for 2 hours and 30 minutes. No peaking. (Seriously, try to time it out so no one is going into the freezer during this time. Consistent temperature matters. After the two and a half hours carefully remove the bottle from the freezer. Time matters here, so you want to move relatively quickly. However, you need to be as smooth as possible. Don’t jostle the bottle or hit it on anything until you are ready. Have your child gently take the bottle and hit it, bottom down, onto a table. (Alternative for younger kids: have them hit the bottle.) Watch closely while you hit the table, and you will see the ice freeze into slush instantly! It really is pretty cool how quickly it happens. The ice the is created is slushie. It is easiest to cut the bottle to get the slush out if you want to play with it or eat it. The slush will quickly turn back to water though. Warning for this one. It can take a few tries to get it right, as you do have to be very careful before you hit the bottle. To help with that it is a good idea to start freezing two bottles, and after about 15 minutes put two more in the freezer. (Quickly, of course!) This gives you back up bottles to try again without having to wait the full two-plus hours. The water is in a metastable state when you gently remove it from the freezer. When you hit it on the table or hit the bottle that disruption is enough to cause the water to freeze! That single event starts a chain reaction of crystallization, resulting in the slush. These are fun ways to bring Frozen to life a little bit. Sensory play is important for kids, and tying these projects into a loved movie boosts interest as well. Disney isn’t the only one who can bring magic to the table. Science can make your imagination soar too. Here are some more fun learning activities to try! 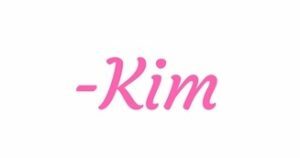 Kim is the mother of 3- a 5-year-old son and two-year-old twin daughters. She blogs at Team-Cartwright.com about life with twins and easy and fun STEM projects for kids. You can follow her on Instagram for new fast learning activities every day!